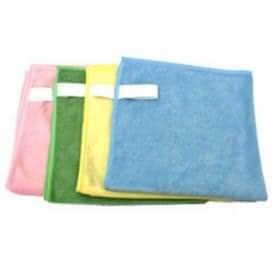 Microfiber Towels | Pro Chem, Inc. Different color cloths allow for a color coded system, which prevents cross-contamination, assures employee safety, and provides a healthy environment. Green: Cafeteria and Food Surface. Use in the following areas: food prep, counters, service areas, tables, dishwashing, vending areas. All non-porous surfaces. Blue: General Purpose. Use on windows, glass, mirrors and polished surfaces, electronics, countertops, furniture, doors and handles. Red: For restroom use. Use on toilets and urinals, bath stalls and doors, and toilet splash areas. Yellow: For restroom and break room use. Use on countertops, sinks, walls, partitions and dispensers.